Last Wednesday morning, the CUESA office at the Ferry Building filled with a strong tar-like reek as 58,000 gallons of viscous, toxic bunker fuel escaped into our Bay after a cargo ship collided with a pillar of the Bay Bridge. The reality of the mess is sinking in (both literally and figuratively) as visible effects of the spill like slicked waters, ailing birds and beached globs of fuel present themselves, and people begin to worry about the less perceptible consequences. Despite estimable efforts by volunteers and others, fewer than 13,000 gallons of the fuel are likely to be recovered, the rest left to wreak havoc in local waters. The spill happened just a week before the opening of Dungeness crab season, a celebrated event for San Francisco, a city whose oldest culinary traditions revolve around seafood. On Saturday, local fisherpeople voted unanimously to ask the state to suspend all fishing for human consumption in local waters and to delay crab season entirely until seafood from the region has been officially deemed safe. The undivided vote is rare for an infamously contentious and competitive group, but all agreed that just one contaminated crab or fish could ruin demand for years to come. Even though most crabbing happens outside of the area known to be affected by the spill, crab holding tanks recirculate seawater and, as they return to ports, could potentially cover crabs with tainted water. On Tuesday, the Governor announced that waters would indeed be closed, though he did not declare specific restrictions. Crabbers and others assumed that their season would be delayed until at least December 1, when crab season opens in the northern part of the state and in Oregon. But to the surprise of many, closures defined on Wednesday by the Department of Fish and Game only extend 40 miles along the coast and three nautical miles out, not a large enough area to effectively delay the season or to allay fisherpeople’s and consumers’ health concerns. At first, many crabbers wondered whether they should scramble to set traps despite their worries, especially since large ships coming from Oregon were beginning to trap. Most area crabbers have opted to stay put, though, and buyers from Bodega to Half Moon Bay have agreed not to purchase local crab. 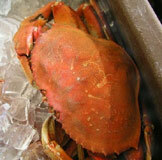 For the time being, Dungeness crab will not be available at the Ferry Plaza Farmers Market. Larry Miyamura of Shogun Fish Company is a salmon angler and former crabber. This year, he and his wife Roz planned to buy crab directly from a friend and sell it at the Ferry Plaza Farmers Market to make some extra money in the off-season. Instead, they will bring fish from outside the region. Like many crabbers, though, the Miyamuras are disappointed—the weekend before Thanksgiving, says Larry, is the best weekend of the year for crab sales. Crabbers are not the only fisherpeople affected by the spill. Among the other crippled fisheries, according to a Department of Fish and Game press release, are California halibut, herring, bay shrimp, white croaker, groundfish, surfperch, Pacific sardines, and northern anchovy. Last Friday, the state also closed Drakes Estero, where the Lunny family produces a significant portion of the state’s oyster crop. The Tomales Bay waters where Hog Island Oyster Company farms shellfish are still safe, since the slick has not (yet, at least) reached the area. The full effects of this tragedy will probably continue to be uncovered for years to come. We all wish the spill could have been prevented, or at least contained sooner. Rather than dwelling in regret, our energies are better spent joining together, helping with cleanup, and working to prevent this from ever happening again. California lawmakers have vowed to propose legislation that would require ships to have tougher hulls and would improve oil spill response. If the spill has any positive impact, it will be to illuminate the many problems that our Bay faces, the far-reaching effects of an unhealthy watershed, and the importance of being good stewards. The vibrancy, culture, and economy of our region depend on a thriving Bay. You can help by becoming a trained clean-up volunteer, assisting with habitat restoration, or by making a donation. Learn more at savesfbay.org and baykeeper.org.